Choosing a CZ wedding or engagement ring is a big decision when it comes to one of the most important rings that you will wear. however, if you do, you will save yourself a fortune. Cubic Zirconia (CZ) is a synthethic gemstone and one that looks more like a diamond than anything else out there. Plus it is low cost and durable. Will A CZ Ring Last? The durability of a CZ ring is something that has bothered me for years because although I am more than happy to wear a very glamorous ring that has cost a fraction of the 'real thing' I would hate for it to fall apart. The key is to buy a good quality CZ ring from a reputable retailer. And there are lots of retailers of CZ rings! Ebay - here you will find the biggest and cheapest selection. 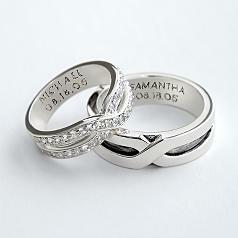 I really like this silver cz wedding ring and it's not just the price! Love the fact that it is stainless steel as well. This is probably the most practical ring I have ever found and you will not believe the price - $0.99! Crazy! Find out more at Amazon and they have loads of other styles to choose from. 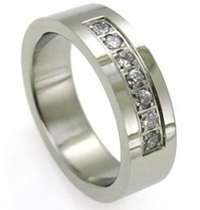 A little bit of spakle is also great for your man's wedding ring, this one is Stainless steel which makes it a strong ring, a macho sparkle! More information at Elite Jewels. There are not that many cz gold wedding rings, thankfully this one is classy, you really couldn't tell these are not diamonds. This really is looking like the real thing. As this ring is made from gold it is not the cheapest ring but I know that for some of you this will make it more real. When you have decided to be practical with your wedding ring choice you don't want to lose out on the emotional side. I think this ring has emotion and love in bucket loads as you can personalize the ring by adding your names and your wedding date to the inside of the rings. A friend of mine has a CZ engagement ring, it is a big pink sparkle and that is the only real reason we know it is not the real thing is the color and the fact that it is so large! If you want your wedding ring to look like the real thing it is worth keeping the size of the stone realistic! 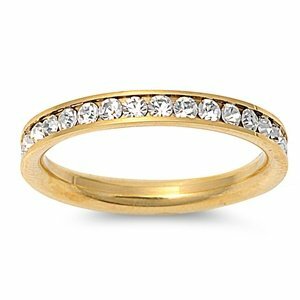 If you have decided to have a CZ wedding ring to add some additional sparkle it will be worth trying it with your engagement ring to ensure they work together. Plus if you are looking at wearing it by itself as your engagement ring may be a bit too fancy for work then make sure you are happy with the ring by itself. 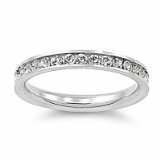 The biggest reason that people choose this style of ring is the price, they are such a saving and you would be hard pushed to tell that you were not wearing real diamonds. And when you think that you would be saving thousands towards a deposit on your first home or your honeymoon or wedding, instead of wearing it, it makes perfect sense. Plus you could always ask for the real thing for your 10th wedding anniversary present, which is diamonds on the modern anniversary list. However, I am sure you would want to keep the original! At the end of the day it is not the amount of money that you have spent on your wedding ring that is important it is the love that you share and the symbol that is your wedding ring.